It was another banner weekend at Pimlico for clients of BSW Bloodstock as HAPPY MESA, YOSHIDA and WHITMORE all won stakes races. 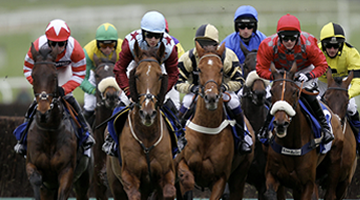 This marks the second year in a row that BSW clients have enjoyed success at the Baltimore racetrack in May. Last year, longtime BSW client Sol Kumin hoisted the Woodlawn Vase after BSW private purchase Exaggerator won the G1 Preakness. BSW clients didn’t have a horse in this year’s renewal of the Preakness but that didn’t stop them from finding their way to the winner’s circle… three times! The Graham Motion trained HAPPY MESA kicked off Preakness weekend on Friday when winning the Hilltop Stakes. BSW privately purchased HAPPY MESA for Highclere America and Great Point Partners in 2016 and the daughter of Sky Mesa is just now finding her true form. Racing last of all, HAPPY MESA made a sweeping move around the home turn to overtake her competition and win by a length. HAPPY MESA has now won and finished second in two stakes races in 2017. 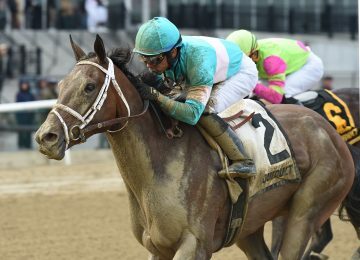 Success rolled from Friday to Saturday as YOSHIDA (JPN) navigated his way from last to first in the James W. Murphy Stakes to win by four lengths. The son of Heart’s Cry (JPN) was part of a lease deal put together by BSW Bloodstock on behalf of Head of Plains Partners at the beginning of 2017 to join existing owners WinStar Farm, China Horse Club and SF Racing. 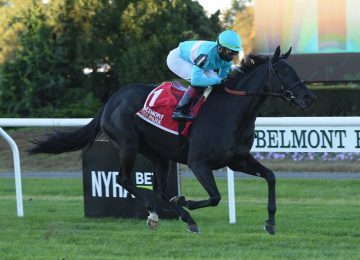 This has proved a wise investment as YOSHIDA broke his maiden at Keeneland in April by four lengths and was named a TDN Rising Star for the effort. YOSHIDA showed his bravery and impressive turn of foot to win this Listed race and now has two wins from two starts in 2017. Preakness weekend was capped off by the lightening fast WHITMORE in the G3 Maryland Sprint Stakes. 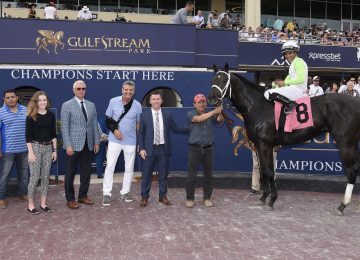 WHITMORE was a BSW private purchase for Head of Plains Partners to join owners Southern Springs Stables and Robert LaPenta after winning the Hot Springs Stakes in March. WHITMORE won his last outing in the G3 Count Fleet Sprint Handicap. That performance forced him to carry six more pounds than the rest of the field on Saturday, but that didn’t stop him from stalking the pace and closing fast to win by half a length. WHITMORE is undefeated in 2017. BSW Bloodstock would like to thank all our clients and partners who made ANOTHER Preakness Weekend unforgettable! BSW clients have a lot to look forward to in the year ahead and we can’t wait to be back in Baltimore, MD this time next year!